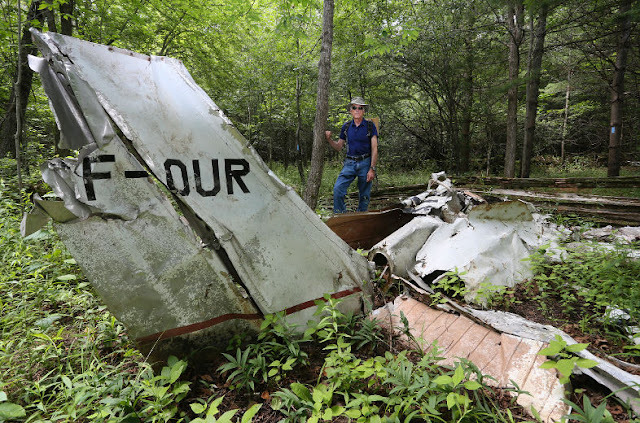 Ron Savage, director of trails for the Bruce Trail Conservancy's Sydenham Club, stands behind the remains of a Cessna 205 on the Silent Valley Nature Reserve on Saturday July 18, 2015 just north of Bognor, Ont. The plane carrying 4 people from Toronto crashed on September 26, 1970 killing all on board. The wreckage of the plane found scattered over the property has been collected into a memorial. You won't find the name on local maps, but a hike at Silent Valley can show why the area has stories enough to inspire a book. Ron Savage, the trail director for the Sydenham Bruce Trail Club, is so enamoured with the 200-acre swath of land on the east side of Bognor Marsh that he wrote Silent Valley, a 33-page magazine-style book about what Silent Valley Nature Reserve -- the name given to Lot 13, Concession 3 of Sydenham Township by Savage and the Bruce Trail Conservancy -- has to offer for hikers and explorers. Savage, who's been a trail director for 15 years, has worked tirelessly on keeping the Bruce Trail accessible and beautiful. "A friend of mine was an avid Bruce Trailer. She told me I should try it out and I fell in love with it," said Savage. Savage grew up in Durham and worked as a lineman for Bell Canada for most of his life. Even before he retired he developed an interest in Bruce Trail. Savage wrote the book because, in his opinion, Silent Valley just has a lot to offer. "It's just got so much. I can take a group of people on this little section of trail and keep them entertained all day," said Savage. The area was acquired from the Crown in the late 1860s by a family from Scotland, the Wilsons. They erected a couple of cabins and even a barn of cut and layered stone, massive by the standards of the day at 92 by 62 feet. In 1904 the land was sold to the Frizzell family. In 1967, it went from the Frizzells to Hallman Lumber. Finally, in 2013, it was purchased by the Bruce Trail Conservancy. Parts of the Wilson homestead still stand, including some of the foundation of the old barn and an intact well made of stone. Another area of interest, a 10-minute hike from the homestead, is the wreckage of an old Cessna 205 that crash landed in the forest on Sept. 26, 1970. The plane, travelling from Toronto to Griffith Island, was caught in weather so severe that it began to come apart in mid air. All four passengers of the plane died in the crash. Spectacular caves, sculptured boulders and plenty of fossils are just a few of the other things that make the area interesting enough to write a book about. All proceeds from sales of the book go back to the Bruce Trail Conservancy for further land acquisitions along the Escarpment. The goal of the BTC is to secure the Bruce Trail via donations and land purchases. About half of land along the trail is made accessible through handshake agreements with private owners and is still vulnerable to development and outside purchasing. The BCT hope to someday preserve all the land for future generations to enjoy and explore. On July 19, 2015, about 1909 eastern daylight time, a Cessna 172S, N962SP, was substantially damaged when it impacted terrain shortly after takeoff from runway 27 at the Linden Airport (LDJ), Linden, New Jersey. 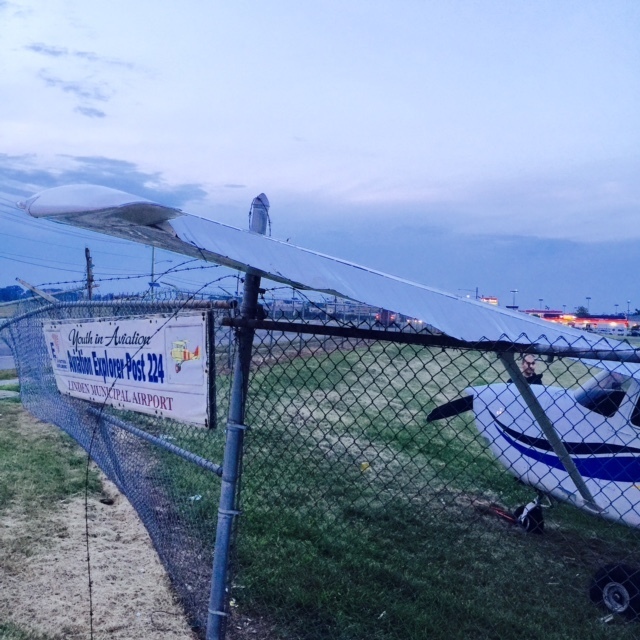 The private pilot and three passengers were not injured. Visual meteorological conditions prevailed, and no flight plan was filed for the personal flight, which was operated under the provisions of Title 14 Code of Federal Regulations Part 91. The flight was originating at the time of the accident. The pilot reported that after takeoff, the airplane "felt heavy" and he attempted to abort the takeoff and set the airplane back onto the runway. The pilot stated the airplane bounced two or three times before he flew in ground effect to bleed off airspeed. 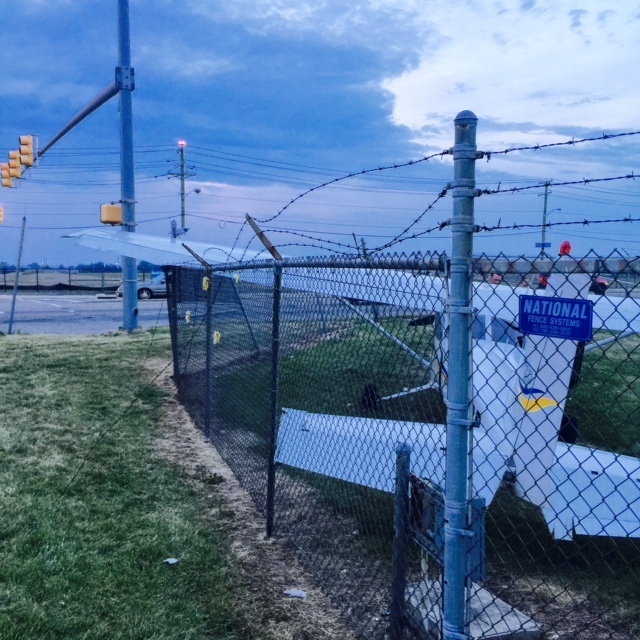 The airplane touched down near the end of the runway and continued into the grass before impacting a fence. Examination of the wreckage at the scene by a Federal Aviation Administration (FAA) inspector revealed that the airplane impacted a fence approximately 200 yards beyond the end of the runway, resulting in substantial damage to both wings and the fuselage. The fuel gauges indicated that the fuel tanks contained a total of 46 gallons of fuel. The wing flaps were in the retracted position, and the pilot stated he took off with zero flaps. The 1915 recorded weather observation at LDJ included wind calm, visibility 10 miles and clear, temperature 81 degrees F, dew point 73 degrees F; barometric altimeter 29.88 inches of mercury. 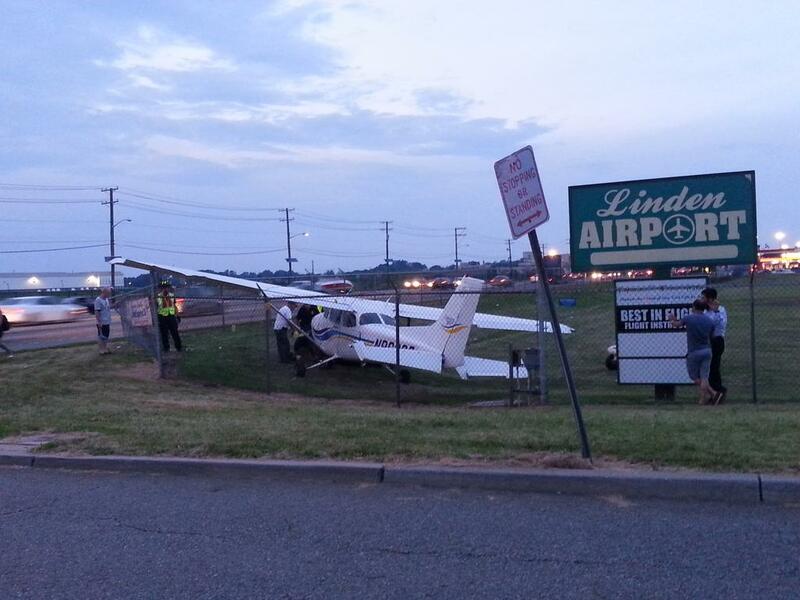 LINDEN, NJ - A single engine plane lost power and crashed into a fence at the end of the runway during take off from Linden Airport Sunday evening. According to police at the scene, all four occupants on board walked away from the crash and refused medical attention. 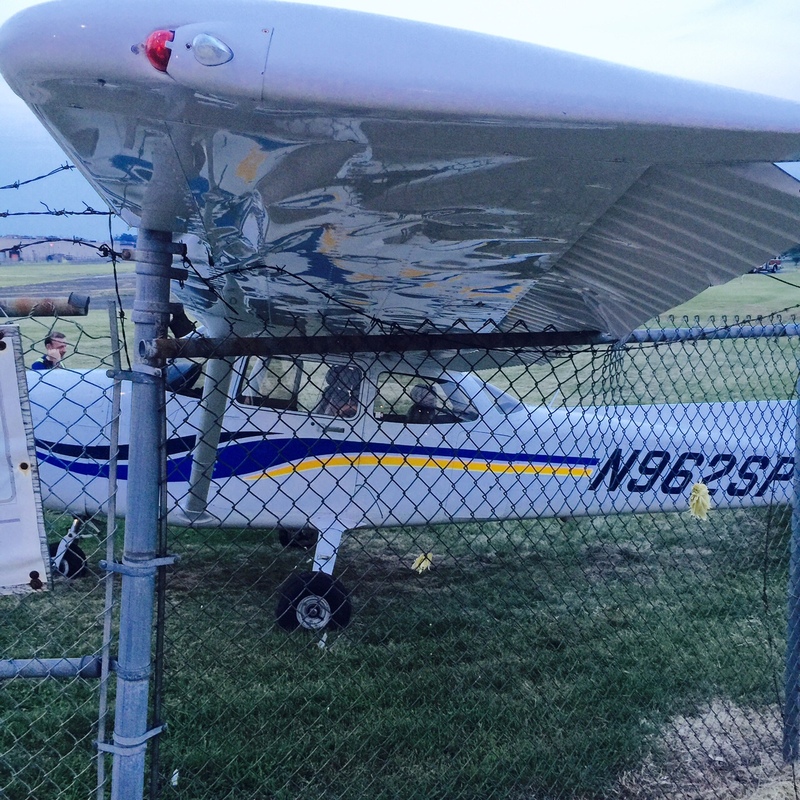 The plane came to a rest against the fence bordering Routes 1 & 9, just feet from the northbound traffic. TAP into was on scene moments after the crash and the occupants refused to comment on the accident. We will follow up as more information is obtained. 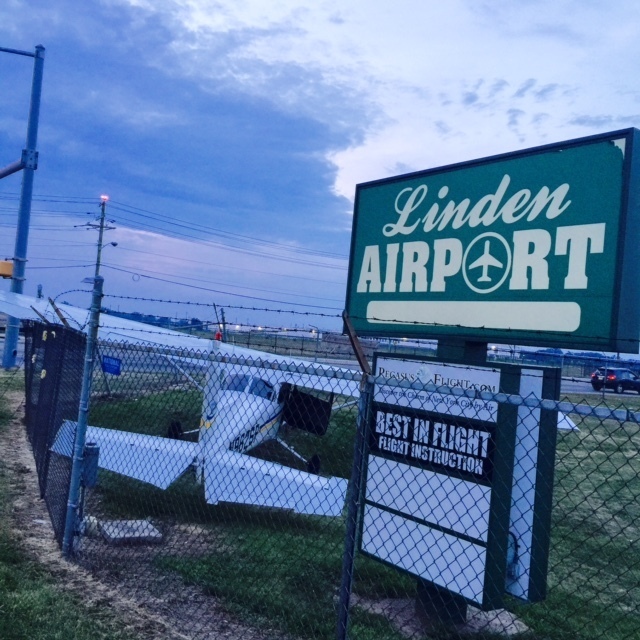 LINDEN — A small plane crash-landed against a fence after aborting a takeoff at the Linden Airport Sunday evening, according to police and witnesses. The airport director said it was a private flight, and it's not known why the takeoff had to be called off. "There were no injuries, just some bent tin," Paul Dudley said. Dudley said about 50,000 flights come in and out of the airport every year, and this sort of thing — though it was relatively minor — hasn't happened in years. A photograph on Instagram showed the propeller plane on a small hill near the front sign for the airport. 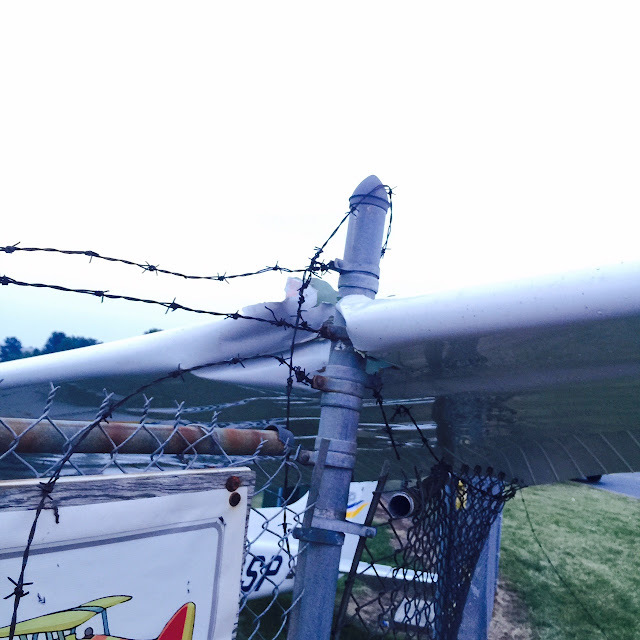 "There's a saying in aviation: if the brakes don't stop you, the fence will help you," Dudley said. Mark Tripodi said he was driving up Route 1 north when he saw the plane bouncing off the runway, going way too fast. 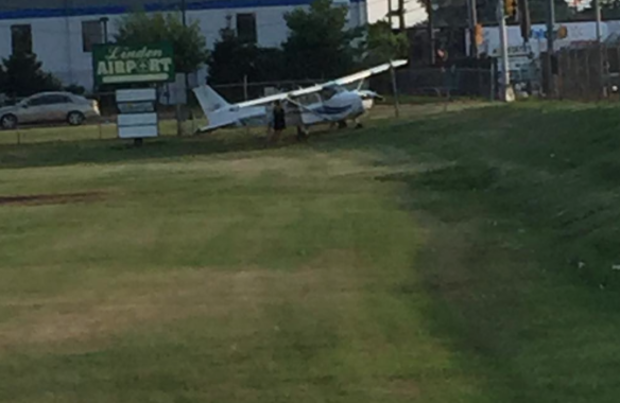 He's not sure if the plane was failing to take off or failing to land, but it skidded off the runway and hit a fence along Route 1, spun around, and came to a stop. "Luckily, the fence was there, because it could have been disastrous," said Tripodi, whose family got out to make sure everyone was OK. Two adults, a teenager and a child were in the plane, Tripodi said, and they all walked away. Police said they were in the early stages of responding to the incident, which was reported before 7 p.m.
LINDEN, N.J. (CBSNewYork) — A small, single-engine plane crash-landed near Route 1/9 in Linden, New Jersey Sunday evening. 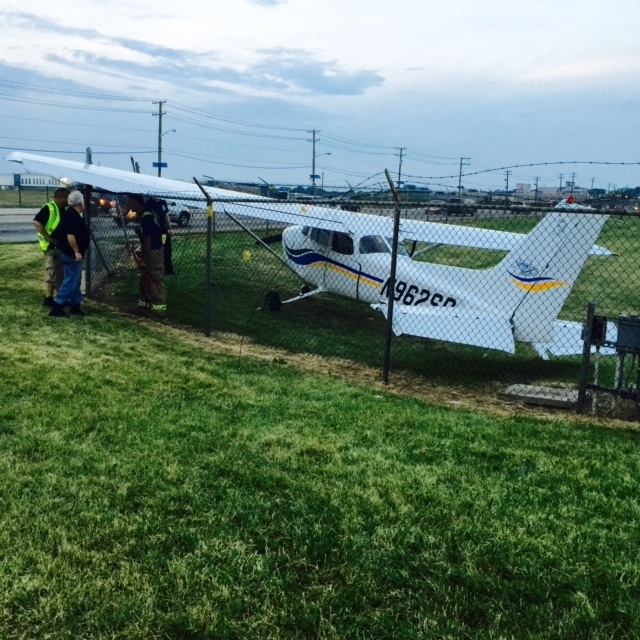 The plane tried to take off from Linden Airport just before 7 p.m. and instead hit a fence near the highway, WCBS 880’s Tom Kaminski reported. The pilot reported that he visually checked the airplane’s fuel tanks before departure but that he did not measure the amount of fuel. He added that the fuel flow meter showed that the airplane had 9.7 gallons of fuel at takeoff. After takeoff, the pilot flew to a city about 70 miles away, took some photographs over another city, and then conducted a touch-and-go at another airport. Shortly after, he turned the airplane north, and, about 30 seconds later, the engine lost power and then “quit.” During the subsequent forced landing on a beach, the engine sustained damage, and the fuselage and right wing spar sustained substantial damage. An on-scene examination of the wreckage revealed no apparent fuel spills, leaks, or stains nor were any found in the hangar after the airplane was recovered. Due to the damage, the engine could not be test run. When examined, the gascolator was found nearly filled with fuel; the total recovered fuel on board was estimated to be about 1/2 gallon. It is likely that most of the fuel was used during the flight and that the small amount of fuel remaining was not sufficient to reach the engine while the airplane was turning, which led to the engine losing power. Given the lack of fuel, the pilot likely did not conduct adequate preflight fuel planning to ensure that there was sufficient fuel for the flight and that required reserves (30 minutes) for visual flight rules flight remained. A total loss of engine power due to fuel starvation during cruise flight. Contributing to the accident was the pilot’s inadequate preflight fuel planning. 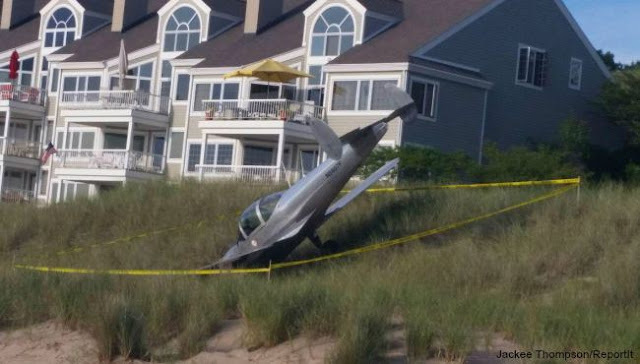 On July 19, 2015, about 1905 eastern daylight time, an Alon A2 single-engine airplane, N5607F, impacted soft terrain during a forced landing following a total loss of engine power near Holland, Michigan. The private pilot, who was the sole occupant, sustained minor injuries. The airplane sustained substantial damage. The airplane was registered to and operated by the pilot under the provisions of 14 Code of Federal Regulations Part 91 as a personal flight. Visual meteorological conditions prevailed for the flight, which did not operate on a flight plan. The flight originated from the West Michigan Regional Airport (BIV), near Holland, Michigan, about 1900, and was destined for the Grand Haven Memorial Airpark (3GM), near Grand Haven, Michigan. The pilot indicated that he visually checked the airplane's fuel tanks before departure but that he did not measure the amount of fuel. According to his accident report, the airplane had 9.7 gallons of fuel at its last takeoff. He reported that he flew south from Grand Haven, Michigan, to St. Joseph, Michigan (which was 70 miles away), then turned north to take photographs over Fenville, Michigan. He proceeded to BIV and conducted a touch-and-go-landing. After taking off from BIV, he turned the airplane from a west heading to a north heading to return to 3GM. After completing the turn, the airplane lost engine power, and the engine "quit" about 30 seconds later. He said that there was low-level turbulence during the flight. He performed a forced landing on a beach where the airplane came to an abrupt stop when the nose landing gear contacted the soft sand. The airplane sustained engine damage and substantial fuselage and right wing spar damage. A Federal Aviation Administration inspector examined the wreckage on scene. The inspector indicated that there were no apparent fuel spills, leaks, or stains at the beach site, nor in the hangar where the airplane was recovered. The gascolator was nearly filled with fuel before being drained to ascertain the total fuel on board. The amount of recovered fuel was estimated to be about 1/2 gallon. The type certificate data sheet for the accident airplane indicated that it had a fuel capacity of 24 gallons of fuel and it did not list an unusable amount of fuel for the airplane's fuel system. At 1855, the recorded weather at the Muskegon County Airport, near Muskegon, Michigan, was: Wind 310 degrees at 6 knots, visibility 10 statute miles; sky condition few clouds at 5,500, broken clouds at 21,000; temperature 24 degrees C; dew point 14 degrees C; altimeter 29.85 inches of mercury. On July 19, 2015, about 1905 eastern daylight time, an Alon A2 airplane, N5607F, impacted soft terrain during a forced landing following a loss of engine power near Holland, Michigan. The private pilot, who was the sole occupant, sustained minor injuries. The airplane sustained substantial firewall damage. The airplane was registered to and operated by the pilot under the provisions of 14 Code of Federal Regulations Part 91 as a personal flight. Visual flight rules conditions prevailed for the flight, which did not operate on a flight plan. The flight originated from the West Michigan Regional Airport, near Holland, Michigan, about 1900, and was destined for the Grand Haven Memorial Airpark, near Grand Haven, Michigan. PARK TOWNSHIP, Mich. (WOOD) — It had been an uneventful flight for 20-year pilot Steve Stam. 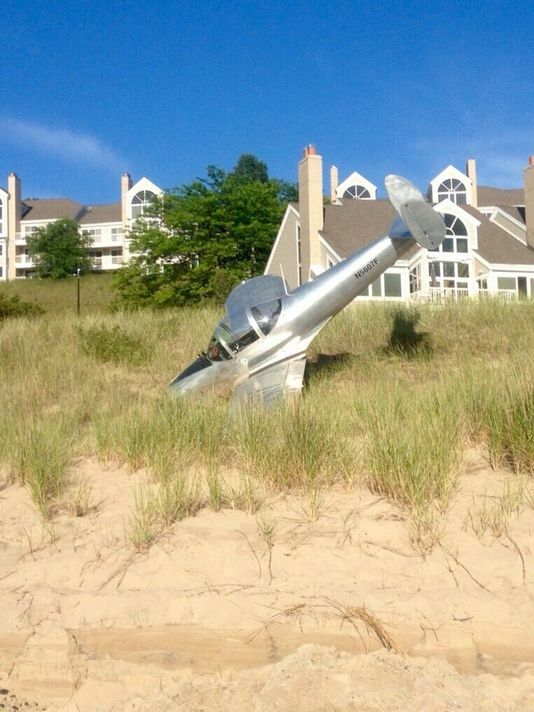 Sunday afternoon, the 66-year-old flew his single-engine 1966 Alon A2 Aircoupe south along the shore of Lake Michigan, did a few touch-and-goes at West Michigan Regional Airport in Holland and then climbed back up into the sky. He turned north to fly back along the lakeshore to Grand Haven. He was near Holland State Park when he ran into trouble. Stam had a multitude of problems to deal with, including keeping the plane in the sky for as long as possible and not hitting anything on the ground when the inevitable happened. With no power, Stam put the nose of the plane down to maintain some speed and looked for landing options. As he glided over Holland State Park, Stam found his landing target: A dune north of the park near Spyglass Condominiums. “The beach was full of people, and the condos are here, and so that left the beach grass to put it down,” he said. That’s exactly what he did. It wasn’t smooth. It wasn’t pretty. The landing gear bit into the sand, putting the aircraft’s nose in the ground and sending Stam into the windshield. The pilot stated that he touched down a little early on the 2,998-foot-long runway, and the airplane began to porpoise. He stated that he attempted a go-around but had insufficient airspeed to maintain control of the airplane. The airplane veered to the left of the runway where it settled into an area of trees and brush. The pilot's failure to maintain control of the airplane during the landing and subsequent go-around. Steven Stam, center, the pilot of a plane that crashed at Park Township Airport, talks with an Ottawa County Sheriff's deputy and the airport manager. The 1977 Grumman American Lynx that crashed in Park Township. 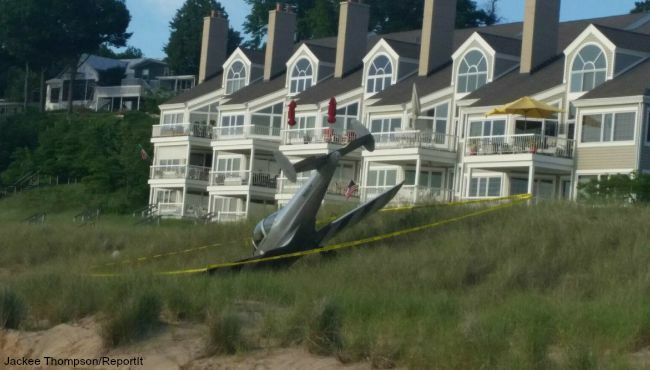 We now know the name of the pilot involved in a plane crash this afternoon at the Park Township Airport on Ottawa Beach Road just west of Holland. Ottawa County Deputies say 61 year old Steven Stam was not hurt in the accident. He was the only person on board when the 1977 single-engine plane crashed into some trees near the runway. Stam told investigators that he landed hard and bounced several times before losing control of the plane. It was heavily damaged in the crash. Worries about dying never crossed pilot Steven Stam's mind when he crashed his plane off the Park Township runway Wednesday afternoon. "I don't think I was ever scared that it was going to do me in. But I thought it might leave a mark," he said, able to laugh a little after escaping essentially unscathed. Stam was practicing landings and takeoffs in the 1977 Grumman American Lynx he bought two months ago in South Carolina when the plane began to bounce during a landing. He tried to abort the landing by taking off again, but ended up losing control and the plane spun off the north side of runway into a tree line. The propeller and a wing were damaged in the 2:02 p.m. crash, but the plane remained upright and Stam was able to walk away. Police said he sustained a minor abrasion from his harness. The National Transportation Safety Board was investigating the crash. The small airport is at the corner of Ottawa Beach Road and 152nd Avenue. Stam acknowledged some tense moments during the landing. The bouncing, also called porpoising, was getting worse as he tried to slow the plane and "I didn't think the air frame could take one more slam." So he gave the plane throttle, hoping to lift again. Instead, he lost control of the plane. Stam, 62, of Park Township, said he has been flying more than 10 years, but the Grumman is the first craft he has owned. The plane may be more difficult to land than other models, such as a Cessna, he said. "These things aren't quite as forgiving," he said. He believed the plane could be repaired and thought the Federal Aviation Administration would classify the mishap as an "incident" rather than a crash. Ottawa County sheriff's Sgt. Ed DeVries said police were looking at whether the plane's wing hit the ground, causing it to spin off the runway. Brad Groenhof, who was remodeling an airport hangar with his father and another worker, saw the plane go into the trees. "The wing grazed the ground and it turned the plane completely around and into the tree line," he said. The trio then drove a car to the plane to help Stam. 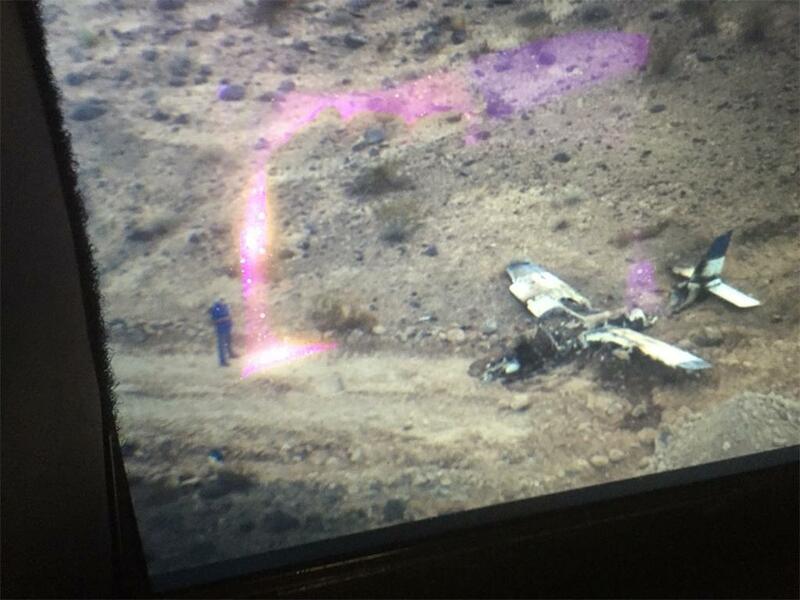 On July 19, 2015, about 1320 Pacific daylight time, a Piper PA-28-181, N8740E, collided with terrain minutes after departing Henderson Executive Airport, Las Vegas, Nevada. The private pilot and three passengers were seriously injured, and the airplane was destroyed by a postaccident fire. The airplane was registered to the private pilot, and operated as a 14 Code of Federal Regulations Part 91 personal flight. Visual meteorological conditions prevailed for the flight, and a flight plan had not been filed. The flight originated from Las Vegas about 1330, and was destined for San Diego, California. The pilot reported that the takeoff seemed normal, but once airborne the airplane's climb was "sluggish" and the engine's rpm's at 200-300 rpm lower than normal. He was able to maintain straight and level flight about 300 feet above ground level (agl). When the pilot made a left-hand turn in an attempt to return to the airport, the airplane immediately began to lose altitude. The pilot selected a landing site, and executed a forced landing into an open area associated with a construction site. During the landing sequence into uneven terrain, the landing gear was torn off, and the airplane caught fire. As soon as the airplane came to rest, the front passenger door was opened and the occupants evacuated the airplane. 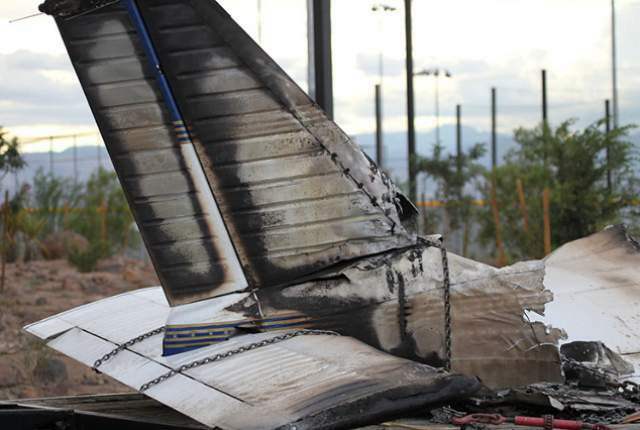 The airplane was consumed by the postaccident fire. The tower controller at Henderson Airport reported that the airplane appeared to not be climbing normally after takeoff, and he cleared the pilot to make any maneuvers necessary to return to the airport if he desired. A witness reported that he observed the airplane takeoff and struggle to gain altitude; it then made a left turn followed by a steep bank turn and crashed. The airplane crashed into an open construction site and the occupants egressed the airplane before it was completely engulfed in fire. The airplane's official weight and balance record was contained in the airplanes maintenance records. Using information from a PA-28-181 Pilot's Operating Handbook, the following was used to estimate expected airplane performance. The pilot reported having 30 gallons (180 lbs) of fuel onboard at the time of takeoff, and the estimated combined weight of all the occupants was 770 lbs. The empty weight of the airplane was 1502.5 lbs. and the listed maximum gross weight is 2,550 lbs. The calculated weight of the airplane at takeoff was 2,452.5 lbs. The airport elevation is 2,492 ft mean sea level (msl), the temperature was 33 C, and the pressure altitude was 30.10 inHg. The calculated density altitude for those conditions was 5,014 ft. Utilizing the climb performance chart for a PA-28-181 for these conditions resulted in an expected rate-of-climb of 520 feet per minute. A review of the airplane's maintenance records revealed that the most recent annual inspection was performed on February 25, 2015, at a total airframe time of 4,040 hours. The mechanic who performed the annual inspection stipulated in the airframe logbook that the carburetor heat control bracket required repair, and that the number 2 navigation radio head required a placard indicating the radio was inoperative. Once those repairs had been made by an A&P mechanic then the entry stated, "this aircraft will be airworthy & ok for return to service." The A&P mechanic who performed the annual inspection stated to the NTSB investigator-in-charge (IIC) that he did perform the engine static rpm check as part of the annual inspection, during which he noticed that the rpm was 10% to 20% below normal. He attributed that reduction in rpm to the loose carburetor heat door which could allow the carb heat to be in an unknown position. Maintenance records obtained from First Flight Corp, San Diego, CA, documented that the carburetor heat bracket was repaired on March 5, 2015. The engine, a Lycoming O-360-A4A, capable of producing 180-hp, was overhauled on October 6, 1986, and had accumulated 1,461 hours since the overhaul. The airplane and engine had accumulated a total of approximately 150.4 hours over the 10 years preceding the accident. On July 23, 2015, the engine was examined by a technical representative of Lycoming under the oversight of a Federal Aviation Administration (FAA) inspector. During the examination, the top spark plugs were removed, examined, and photographed. The crankshaft was rotated by hand utilizing the propeller. The crankshaft was free and easy to rotate in both directions. "Thumb" compression was observed in proper order on all four cylinders. The complete valve train was observed to operate in proper order. Clean, uncontaminated oil was observed at all four rocker box areas. Investigators noted that each of the intake valve rockers exhibited limited movement estimated to be about 50% less than normal. The intake valves of opposing cylinders share a common cam lobe. To facilitate further internal examination, holes were drilled through the top of the engine case material in-line with the rotational plane of each connecting rod. A lighted borescope was inserted to visualize each of the cam lobes at the respective cylinder position. Visual examination confirmed signatures of excessive wear on the intake cam lobes. Mechanical continuity was established throughout the rotating group, valve train and accessory section during hand rotation of the crankshaft. The bottom spark plugs were not removed. The combustion chamber of each cylinder was examined through the spark plug holes utilizing a lighted borescope. The combustion chambers remained mechanically undamaged, and there was no evidence of foreign object ingestion or detonation. The valves were intact and undamaged. There was no evidence of valve to piston face contact observed. The left and right magnetos remained securely clamped at their respective mounting pads and had been thermally damaged due to the effects of the post impact ground fire. The ignition harness was secure at each magneto. The magnetos were removed for examination. The magnetos sustained varying degrees of thermal damage that rendered the unit inoperative and therefore, could not be functionally tested. Magneto to engine timing could not be ascertained. There was no oil residue observed in the exhaust system gas path. There was significant ductile bending of the exhaust system components. The exhaust system was found free of obstructions. A subsequent teardown examination of the engine was conducted September 01, 2015, under the oversight of the NTSB investigator-in-charge. The engine was completely disassembled. The cylinder(s) combustion chambers and barrels remained mechanically undamaged, and there was no evidence of foreign object ingestion or detonation. The valves were intact and undamaged. There was no evidence of valve to piston face contact observed. The pistons were intact. The ring assemblies at each piston were intact and free to rotate within their respective ring land. Mechanical continuity of the rotating group and internal mechanisms were established visually during the disassembly and examination of the engine. The accessory gears including the crankshaft gear, bolt and dowel were intact and remained undamaged by any pre-impact malfunction. There was no evidence of lubrication depravation found. The crankshaft and attached connecting rods remained free of heat distress. The valve tappet faces exhibited significant spalling damage. Lycoming Engines Mandatory Service Bulletin SB301B, dated February 18, 1977 provides guidance for maintenance procedures and service limitations for valves. In particular Paragraph 1,(b) states "Rotate the engine by hand and check to determine that all cylinders have normal lift and that rockers arms operate normally" a 400 hour inspection interval. The logbooks did not contain any record of a camshaft lobe inspection, camshaft replacement or compliance with this SB. According to Lycoming Engines Service Instruction SI1009AW "Recommended Time Between Overhaul Periods" the subject engine should be overhauled at 2,000 hour intervals or before the twelfth year, whichever occurs first. Lycoming Engines Mandatory Service Bulletin SB480E provides guidance when inspecting oil system screens and filters for contamination during inspection cycles. On July 19, 2015, about 1330 Pacific daylight time, a Piper PA-28-181, N8740E, impacted terrain minutes after departing Henderson Executive Airport, Las Vegas, Nevada. The private pilot and three passengers were seriously injured, and the airplane was destroyed by a post accident fire. The airplane was registered to the pilot, and operated under the provisions of 14 Code of Federal Regulations Part 91 as a personal flight. Visual meteorological conditions prevailed for the flight, and a flight plan had not been filed. The flight originated from Las Vegas about 1330, and was destined for San Diego, California. The controller at Henderson tower reported that the airplane appeared to not be climbing normally after takeoff, and he cleared the pilot to make any maneuvers necessary to return to the airport if he desired. A witness reported that he observed the airplane takeoff and struggle to gain altitude; it then made a left turn followed by a steep bank turn and crashed. The airplane crashed into a open construction site and the occupants egressed the airplane before it was completely engulfed in fire. BIRMINGHAM, AL (WBRC) - A Birmingham man who is in critical condition after a plane crash in Henderson, Nevada hopes to be transferred back to Birmingham by the end of the week. Andrew Brown, 33, was one of four people on board the plane that crashed on July 19. He says 30 percent of his body is burned. Brown is being treated at UMC in Las Vegas. The Federal Aviation Administration (FAA) says the plane crashed shortly after takeoff. Brown said he has flown numerous times in all kinds of planes and felt something was wrong as soon as they took off. He said the pilot did everything to make sure all four passengers had a soft landing. But once they hit the ground, they knew the struggle would be getting out of the aircraft safely. "I think the scariest part is when you open the door and there's nothing but fire there and there's only one way out and that was through the flames. Me and the guy in the backseat just, it was either stay in the plane and blow up or run through the fire. We ran through the fire," Brown said. All four people in the plane survived but every one sustained injuries. Brown helps run a family business in Columbiana: Brown Lumber and Supply, Inc.
HENDERSON, Nev. - Two people were critically hurt and two others suffered minor injuries when a small plane headed to Southern California crashed near Henderson Executive Airport Sunday outside Las Vegas. Authorities say the Piper PA-28-181 Archer II plane crashed around 1:20 p.m. Sunday about 3 miles south of the airport. Clark County Department of Aviation spokesman Paul Bobson says a fire ignited after the crash, and the plane is a total loss. Witnesses said four men got away from the plane before it fully burst into flames. City spokeswoman Kathleen Richards says all four occupants were transported to the hospital. Two had critical burns. The other two had injuries that were not life-threatening. According to KTNV, three of the four occupants aboard were members of the Navy heading back to Naval Special Warfare Command in San Diego following a private trip. The plane was registered out of Virginia, KTNV reported. John Degatano shot video of the plane crash after he saw the smoke nearby and rushed to the scene. He initially went to the plane thinking someone was still trapped inside and didn't start recording until he realized the people were well away from the wreckage. "I tried to go back and forth to all four of them and wipe them down, wet them down," he told KTNV. "That was all I could do." Federal Aviation Administration spokesman Ian Gregor says it was not clear what caused the crash. The FAA and the National Transportation Safety Board are investigating. A FOX5 viewer shared this picture of the burning wreckage of an airplane after it crashed near Henderson on July 19, 2015. HENDERSON, Nev. – Columbiana business owner Andrew Brown was one of four people injured in a small plane crash near Henderson, Nev., on July 19. Handley said burns cover about 30 percent of Brown’s body, according to his father, Andy Brown, who flew out to Nevada on July 19 to be with his son. Andrew and Andy Brown operate Brown Lumber and Building Supply in Columbiana. 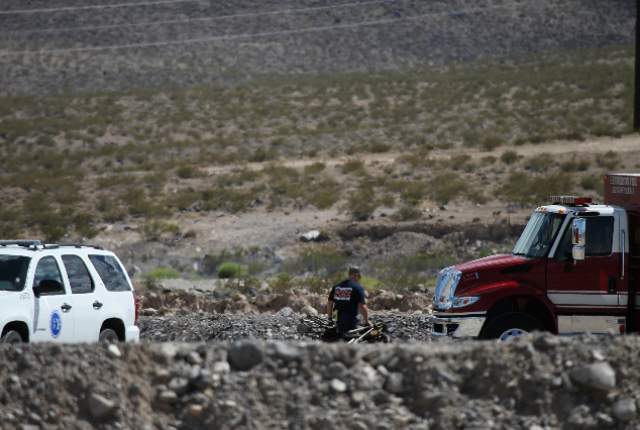 The plane, a single-engine Piper PA 28 crashed under unknown circumstances at about 1:20 p.m. after departing from Henderson Executive Airport, according to Public Affairs Manager Ian Gregor with the Federal Aviation Administration. The plane caught fire after crashing with four people on board, Gregor wrote in a July 20 email. 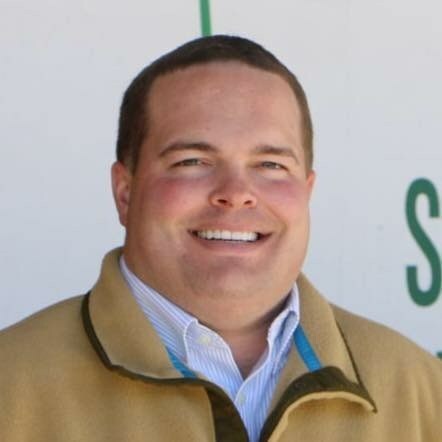 Smiley Fortner, store manager at Brown Lumber, said Andrew Brown was “doing OK” as of the afternoon of July 20 and could be back at home by the weekend. Fortner said numerous people had called the store to express concern and well wishes for Brown. Three of the four men injured in a small plane crash near Henderson Executive Airport Sunday are active-duty military — a Navy SEAL and two sailors assigned to the Naval Special Warfare Command in Coronado, Calif., the Navy said Monday. The servicemen, whose names have not yet been released, are in serious but stable condition at University Medical Center, the Navy said. "They were on a private aircraft on a personal trip that they were returning from. All were in a liberty status," Lt. Cmdr. Mark Walton said by telephone from Coronado, which is home to several SEAL teams and other components of the Navy‘s special operations forces. Walton said a fourth man in the single-engine Piper Cherokee is a civilian. Witnesses said the plane was on fire when it crashed in the desert three miles southeast of Anthem, near the Inspirada community, after departing from Henderson Executive Airport at about 1:20 p.m. Sunday. The men were able to escape the wreck about 90 seconds before it exploded. The registered owner of the airplane, Jody Lee Stuckey, 31, of Chula Vista, Calif., on Monday was listed as a patient in the University Medical Center burn unit, though no information about his condition was available Monday. Walton wouldn‘t identify the servicemen, but according to media reports Stuckey completed basic training at the Navy‘s Recruit Training Command in Great Lakes, Ill. in 2013. 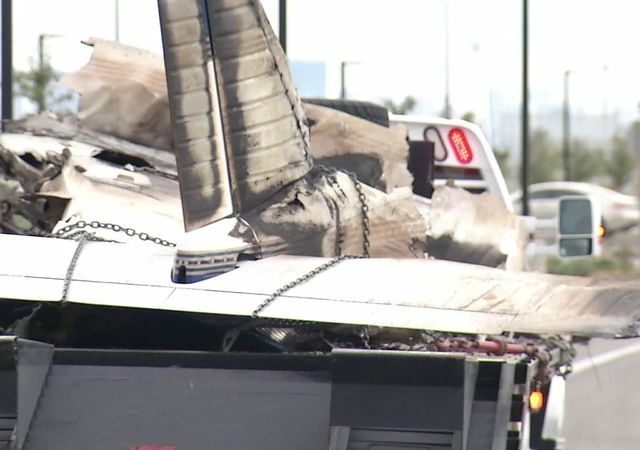 National Transportation Safety Board investigators on Sunday had the wreckage hauled to "a secure place," at the Henderson airport, said Aviation Safety Investigator Van McKenny. Determining the cause of the crash could take as long as a year, he said. McKenny said he doesn‘t know who was at the controls of the airplane when it went down. Eye witness Carmine Buonanno said the plane had trouble gaining altitude after takeoff. He looked away momentarily and then saw the plane‘s tail upright, the fuselage heading toward the ground. He said he rushed to the crash site and saw passengers emerge from the wreckage. About a minute later, he said, the plane exploded. "They missed death by about a minute and a half." Another witness who responded said he gave first aid to the men, treating two who suffered burns by pouring water on them and covering them with a wet T-shirt. 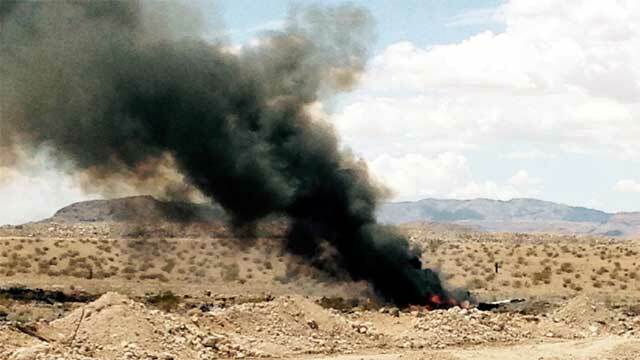 Four people were taken to the hospital after their plane crashed in the southeast valley, officials say. The aircraft went down after catching fire at 1:20 Sunday afternoon, in a desert area about three miles southeast of Anthem, near the Inspirada community, after departing from the Henderson Executive Airport, city spokeswoman Kathleen Richards said. It was bound for Southern California, Department of Aviation spokesman Paul Bobson said. All four passengers were transported to University Medical Center, Richards said. Two of them suffered critical burns, and two have nonlife-threatening injuries. The plane, a fixed-wing single engine Piper, was registered to Jody Stockey, according to the FAA. The plane registration lists an address in Virginia City, Va., but Stuckey‘s FAA pilot certification lists an address in San Diego. In 2013, news media in Illinois reported that Stuckey completed U.S. Navy basic training at Recruit Training Command in Great Lakes, Ill. Carmine Buonanno, who works at the model homes nearby, said he saw the whole thing. From the beginning, the plane had trouble getting altitude, he said. "It looked like it was a hundred years old." The FAA registration lists the plane as being manufactured in 1976. After looking away for five seconds, Buonanno says he turned to the sky and saw the tail of the plane up in the air before it ultimately hit the ground. Buonanno immediately headed toward the crash, he said. Four people, he described as males in their mid-to-late twenties, emerged from the wreckage and were "walking hard" away from the scene. About a minute later, he heard the plane explode and saw a plume of black smoke from what he estimated to be 75 to 100 yards away. "They missed death by about a minute and a half," he said. Another witness, who identified himself only as "John," said he did not see the plane crash, but noticed the smoke right away. After hearing it was a downed plane, he said he drove as close as he could to the crash without hesitation, then ran the remainder of the distance to the four male passengers. "All I thought about was helping them." John described the condition of the passengers, "their skin was melting off them," he said, prompting him to cool the men with his wet t-shirt and by pouring water on them. "One kid was shouting he was on fire," he said. The identities of the passengers have not been released. The FAA and NTSB are investigating, and the cause of the crash has not been determined, FAA spokesman Ian Gregor wrote in an email. 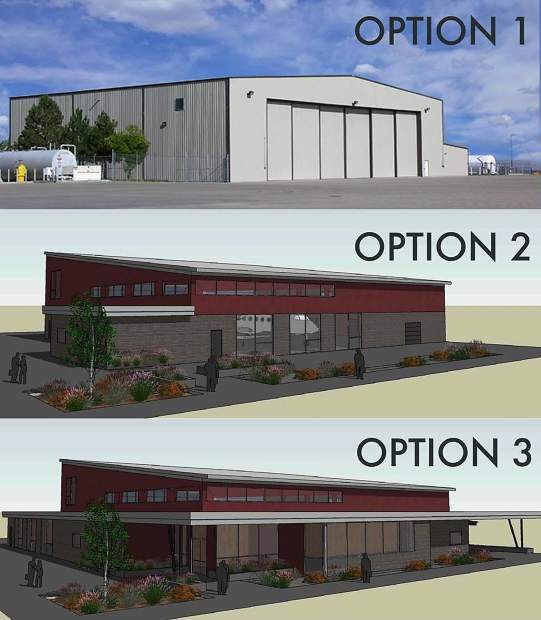 A look at preliminary renderings of the three multi-use hangar options that the Truckee Tahoe Airport District is considering constructing. TRUCKEE, Calif. — The Truckee Tahoe Airport District is seeking input on whether to construct a multimillion-dollar hangar that officials say aim to serve aviation and community uses. Options at $3 million, $6 million and $9 million are being considered — all of which will be 36 feet tall and range between 11,000 to 14,000 square feet — along with a no project option. The district has enough reserve funds to cover the expense of each option, said Kevin Smith, TTAD general manager. “We only need the $3 million building to de-ice an airplane,” he said. “Everything else is community space. When you start adding all the extra stuff that the airplanes don’t need, but the community would like or would provide community benefit, then the price goes up. In an effort to answer that question, the district is gathering input from local nonprofits and recently launched a FlashVote survey. The survey will close at 5 p.m., Monday, July 20, with its results and nonprofit feedback to be presented to the board of directors at its Wednesday, July 22, meeting, said Seana Doherty, owner of Truckee-based Freshtracks Communications. Freshtracks is assisting the district in community outreach, at a cost of roughly $10,000 to date, Smith said. Overall, the district has spent approximately $150,000 on the hangar project, including outreach, concept and budget planning for the facility, with funding coming from district reserves, he said. The board would likely make a decision on whether to pursue the hangar project in September, Smith said. If approved, groundbreaking could take place next summer, with construction taking about a year to complete, he said. While constructing the hangar would have a multimillion-dollar up-front cost, it would ultimately make money for the airport district, Smith said. According to the district, the first option would yield an estimated $12 million in net revenue by 2055, with the second option estimated to generate $11 million and the final option having a $4 million return. Those estimates are based on de-icing and hangar use fees, and they do not include nonprofit use, Smith said. The board has yet to determine if it will charge nonprofits a use fee, but if so, it will be minimal, he said. As far as whether the hangar would generate additional aircraft traffic, the district doesn’t believe it will based on consultant and staff research, Smith said. Further, for planes that would use this proposed hanger, they could easily be rolled out to accommodate events, which are often scheduled in advance, Smith said. The multi-use hangar was identified in 2013 during an airport master plan update outreach process as a favored capital project by both community members and pilots. 1. Estimated at $3 million, this hangar could house small to large aircraft including business jets year-round with warming and de-icing capabilities. In addition, it could accommodate a 220-person gathering, but wouldn’t have kitchen space for food preparation and would require portable toilets for an event. 2. Estimated at $6 million, this hangar would have the same aviation capabilities as option one, but with additional community amenities including in-floor heating, a backup generator and restrooms to accommodate 200 people. It would not include kitchen facilities. 3. Estimated at $9 million, this hanger would have the same features as option two, but would have restrooms that can accommodate 600 people, a commercial kitchen area, additional community meeting space and exterior canopies. Online: Visit flashvote.com/ttadhangar to take the survey. A press release from the Vilas County Sheriff's Department states that an airplane crash is under investigation. Vilas County 911 received a report of an airplane crash at the Land O Lakes Municipal Airport around 12:10 p.m. Sunday. Investigation determined that a single engine, low wing, homebuilt plane was landing on the north/south grass runway when it crossed over an asphalt portion of runway and went airborne again. Investigators say the aircraft came down on its nose and flipped over upside down. The pilot, a 42-year-old man, and passenger a 40-year-old woman, both of Wadena, Minnesota received minor scrapes and bumps. Their names are not released at this time. Vilas County Sheriff’s Office, Vilas County Emergency Management, Land O Lakes Fire and Ambulance Service, Phelps Ambulance responded to this incident. LAND O'LAKES (WAOW)-- An airplane crashed Sunday afternoon at the Land O'Lakes Municipal Airport according to the Vilas County Sheriff's Department. Authorities say the crash happened around noon. They say it appears a single engine, low wing, home built plane was landing when it crossed over an asphalt portion of the runway and went back into the air. Then officials say the plane came down on its nose and flipped upside down. The 42-year-old pilot and his 40-year-old passenger from Wadena, MN had minor scrapes and bumps, according to sheriff's officials. The airport is closed and authorities say it will remain that way until the Federal Aviation Administration can finish an investigation. After flying over Yellowstone National Park at 13,500 ft, the pilot requested an instrument flight rules (IFR) clearance direct to Billings Logan International Airport (BIL), Billings, Montana. At that time, the airplane was at 13,300 ft and was below the minimum en route altitude of 14,400 ft. After confirming that the pilot could maintain terrain and obstacle clearance, the controller issued an IFR clearance direct to BIL (to the north-northeast) and instructed the pilot to climb to and maintain 15,000 ft. An AIRMET was in effect for icing between 14,000 ft and FL (flight level) 220 in the area; the controller did not provide this information to the pilot, and it could not be determined if the pilot was aware of the AIRMET. After the airplane reached 15,000 ft, the controller made a radar handoff and attempted to transfer radio communications, but the pilot did not respond. The controller stated that the airplane turned east and began a rapid descent. The airplane impacted a creek bed in heavily wooded mountainous terrain at an elevation of 7,762 ft. Tree heights were about 100 ft. There was a scrape mark on the side of one tree, and another tree had the top broken off. No other trees were damaged, consistent with the airplane having descended through the tree canopy in a near-vertical attitude. The airplane was severely fragmented and had been exposed to a postimpact fire. The wreckage, engines, propellers and turbochargers were subsequently examined. The left propeller bore evidence of little or no rotation. Disassembly revealed it was in the “low pitch/high rpm” position. Disassembly of the left engine revealed no anomalies. The left engine turbocharger turbine bore no rotational marks and could not be rotated. No rub marks were noted on the turbine housing. It is likely that the left engine was not operating at the time of impact. The outboard end of the recovered right propeller blade bore chordwise scratches. Disassembly of the right engine revealed no anomalies. The right engine turbocharger turbine rotated freely when turned by hand. The pilot likely lost control of the airplane following the loss of left engine power. Although the airplane was operating in an area conducive to aircraft icing, the reason for the loss of engine power could not be determined during postaccident examinations. The pilot's loss of airplane control following the loss of power in the left engine; the reason for the loss of power could not be determined during postaccident engine examination. 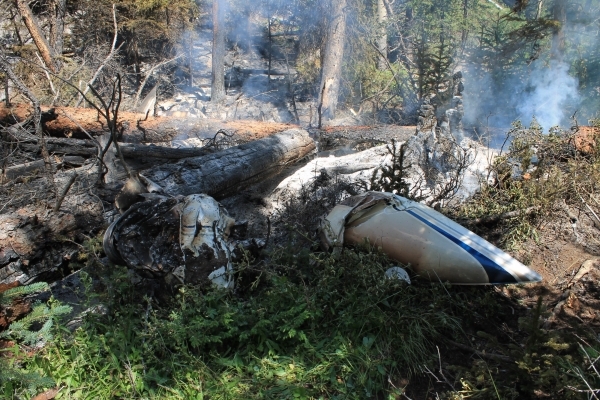 On July 18, 2015, at 1154 mountain daylight time, a Cessna T310R airplane, N72TP, impacted mountainous terrain near Cody, Wyoming. The pilot and three passengers were fatally injured. The airplane was destroyed. The airplane was registered to and operated by Independence Aviation LLC, Englewood, Colorado, under the provisions of 14 Code of Federal Regulations Part 91 as a personal flight. Day visual meteorological conditions (VMC) prevailed at the time, and an instrument flight rules (IFR) flight plan had been air filed. The flight originated from the Sheridan County Airport (SHR), Sheridan, Wyoming, about 1030 and was destined for the Billings Logan International Airport (BIL), Billings, Montana. According to Independence Aviation Dispatch papers, the pilot rented the airplane on July 16, 2015, at 0900, and was scheduled to return on July 21, 2015, at 1800. The passengers included the pilot's girlfriend, his sister (both of the latter retired attorneys) and her husband. Their travel itinerary between July 16 and July 17 is unknown. The airplane arrived at SHR at some time on July 17. They departed SHR on July 18 about 1030. Radar track data indicated that N72TP departed SHR in VMC conditions, turned to a westerly heading, and flew over Yellowstone National Park at 13,500 feet. It then turned south and then east and flew back over the Park. At 1148, the pilot contacted the Salt Lake Air Route Traffic Control Center (ARTCC-ZLC) R16 controller and requested an IFR clearance direct to BIL. At that time, the airplane was still at 13,300 feet. The R16 controller issued a beacon code and identified the airplane on radar but he did not issue a current altimeter setting or confirm its mode C altitude. N72TP was below the minimum IFR altitude of 14,400 feet. After confirming the pilot could maintain terrain and obstacle clearance, the controller issued an IFR clearance direct to BIL and instructed the pilot to climb and maintain 15,000 feet. The controller did not advise the pilot of an AIRMET (airmen meteorology) in effect in that area for icing between 14,000 feet and FL (flight level) 220 (22,000 feet). At 1154, the R16 controller made a radar handoff after N72TP had attained 15,000 feet and attempted to transfer radio communications. There was no response. N72TP was seen to turn east and then southeast in a rapid descent and in the direction of Cody. A low altitude alert was not issued and N72TP was not advised that radar contact had been lost. The R16 controller attempted to contact N72TP several times, and asked another aircraft to attempt to contact the airplane. When radar and radio contact was lost, the airplane was on the 253° radial from the COD (COD) VORTAC (Very High Frequency Omnidirectional Radio Range) at 21 DME (Distance Measuring Equipment) miles. ZLC then contacted the Park County 911 Communications Center and issued an Alert Notice (ALNOT) 23 minutes after radar and radio contact was lost. The pilot, age 66, held a commercial pilot certificate with airplane multiengine and instrument ratings, and private pilot privileges with a airplane single-engine land rating. He also held a third class airman medical certificate, dated June 9, 2015, with no restrictions or limitations. According to his application for this medical certificate, the pilot estimated he had accrued 571 total flight hours. According to a spokesman for Independence Aviation, their records indicated the pilot had logged 162.7 hours in the Cessna 310. N72TP (serial number 310R1628), a model T310R, was manufactured by the Cessna Aircraft Company in 1979. It was equipped with two Continental TSIO-520-EB engines (serial numbers 206174-9-E, left; 244934-R, right), each rated at 300 horsepower, driving two Hartzell 3-blade, all-metal, constant speed, full-feathering Q-tip propellers (left propeller: model number FC7693DF, serial number EB030B; blade 1, K76440; blade 2, K76441; blade 3, K76443). Only the outboard portion of one blade was recovered from the right propeller assembly. Both engines were equipped with Kelly Aerospace (formerly Hartzell, Garrett Allied Signal) turbochargers. Wind, 010° at 5 knots; visibility, 10 miles; sky condition, clear; temperature, 16° Celsius (C.); dew point, 6° C.; altimeter, 30.19 inches of mercury. There was an AIRMET in effect for icing between 14,000 feet and FL (flight level) 220 (22,000 feet) in the area. 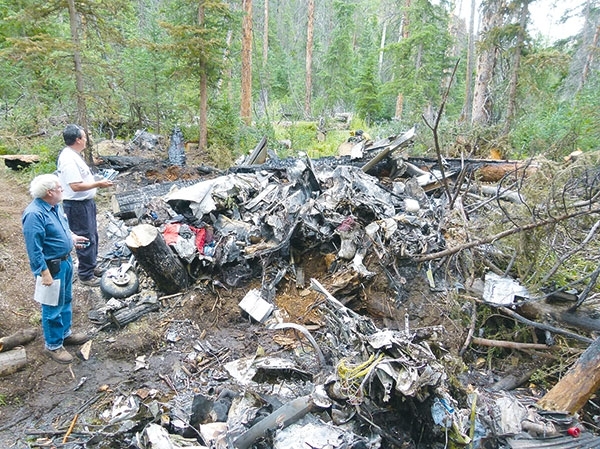 The wreckage was located 1.5 miles west of the Mooncrest Ranch, north of the Buffalo Bill Reservoir, and 4 miles east of 12,244-foot Trout Peak. The airplane had impacted a creek bed in heavily wooded mountainous terrain about 21 miles west-northwest of Cody, Wyoming, at an elevation of 7,762 feet. Tree heights were about 100 feet. There was a scrape mark on the side of one tree, and another tree had the top broken off. No other trees were damaged, consistent with the airplane having descended through the tree canopy in a near vertical attitude. The debris scatter was aligned on a magnetic heading of 230° degrees. Portions of all main components of the airplane -- including both tip tanks, portions of the main fuselage, portions of the horizontal stabilizer and elevator, the vertical stabilizer and rudder, portions of both wings, both engines, and both propellers -- were located in the immediate area of the accident. The airplane was severely fragmented and had been exposed to a post-impact fire. Trees in the immediate vicinity were also fire damaged. Due to the extensive fragmentation of the airplane, photo documentation of the wreckage was made. The wreckage was then recovered and transported to Beegles Aircraft Service, in Greeley, Colorado, for further examination. Autopsies were performed on the pilot and the three passengers by Forensic Medicine and Pathology, Billings, Montana. According to the pilot's autopsy report, death was attributed to multiple blunt force traumas. The pilot's toxicology report revealed no ethanol in the liver and muscle tissue. Ibuprofen and solifenacin were detected in the liver (solifenacin is used in the treatment of contraction of an overactive bladder with associated problems such as increased urination frequency and urge incontinence). Carbon monoxide and cyanide tests were not performed. On December 7 and 8, 2015, the engines, propellers, and turbochargers were disassembled and examined at Continental Motors, Mobile, Alabama. The left propeller bore evidence of little or no rotation. Disassembly revealed it was in the LOW PITCH/HIGH RPM position. Disassembly of the left engine revealed no anomalies. The engine-driven fuel pump vanes were intact, but could only be partially when rotated by hand. There was no evidence of oil starvation. The rod bearings appeared normal. The turbocharger turbine bore no rotational marks. The turbine and compressor could not be rotated. No rub marks were noted on the turbine housing. The compressor bore impact crush damage. The wastegate operated normally. The outboard end of the recovered right propeller blade bore chordwise scratches. Disassembly of the right engine revealed no anomalies. The engine-driven fuel coupling was sheared. The coupling was taken to Continental's metallurgical laboratory for analysis. According to their report, "the fractured surfaces showed evidence of mechanical overload" and "did not exhibit signs of extended contact or rotation after separation." The turbocharger turbine rotated freely when turned by hand. There was some metal splatter noted on the turbine housing. The compressor bore impact crush damage and could not be rotated. The wastegate operated normally. The wreckage was released to the insurance adjuster on January 29, 2016. In addition to the Federal Aviation Administration, parties to the investigation include Textron Aviation (formerly Cessna), Continental Motors, Hartzell Propeller, and RAM Aircraft. Federal investigators have determined that a failed engine likely caused a pilot to lose control of his plane and crash west of Cody last year. 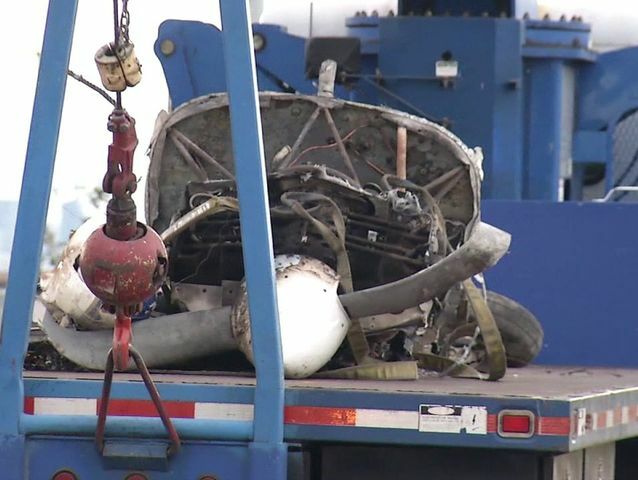 However, after months of investigation, the National Transportation Safety Board (NTSB) was unable to figure out why the left engine of the rented Cessna T310R stopped working. Four people — pilot Don Scott, his friend Joyce Bartoo of Washington, D.C., his sister Diane J. Stubbs and her husband Gerald B. Stubbs of Maryland — all died in the July 18, 2015, crash. Scott was a 66-year-old Denver attorney with some 570 hours of prior flying experience. He’d taken the group for an unplanned detour over Yellowstone National Park as they flew from Sheridan to Billings. After circling Yellowstone, Scott got permission from air traffic control to continue toward Billings; the air traffic controller directed Scott to climb from 13,300 to 15,000 feet shortly before noon. Several minutes later, air controllers lost contact with Scott and the plane, which turned southeast toward Cody and began plummeting. In what the NTSB described as an apparent “near-vertical” dive, the Cessna crashed into a wooded area west of the Mooncrest Ranch and roughly 10 miles northwest of the Buffalo Bill Reservoir. The airplane was smashed into pieces and caught on fire. The NTSB did not reach a conclusion about what caused the engine to stop working. At the time Scott was directed to climb to 15,000 feet, there was an active weather advisory — called an AIRMET — that icing could occur between 14,000 and 22,000 feet. CODY, Wyo. (WUSA9) -- A Washington D.C. resident and two Annapolis, Md. residents were killed in a small plane crash Saturday morning near Yellowstone National Park. According to the Park County Sheriff's Office, Joyce Bartoo of Washington D.C., her sister Diane Stubbs, 68, of Annapolis and Stubbs' husband Gerald Stubbs, 69, of Annapolis were all killed during the July 18 crash. According to the sheriff's office, the three were traveling in a 1979 Cessna fixed wing prop plane flown by Donald Scott, 66, of Denver. They left the Sheridan County Airport after 11:00 a.m. bound for Billings, Montana. Scott however deviated from the flight path and went towards Yellowstone. After circling the park, the plane began traveling towards Billings. However, the sheriff's office says Scott turned east towards Cody and began a steep descent. First responders reached the crash site after 3:00 p.m. and confirmed there were no survivors. Four people — two males and two females — died in a Saturday plane crash northwest of the Buffalo Bill Reservoir, the Park County Sheriff's Office announced Monday morning. There were no survivors. “Taking into account what we know from air traffic control and evidence at the scene, I’m convinced something catastrophic happened aboard that aircraft. However given the condition of the site, it will take some time to sift through the evidence to determine exactly what happened,” Sheriff Scott Steward said in a news release. The sheriff's office has not yet released the names, ages or residences of the victims, saying the people still need to be positively identified and their next-of-kin notified. According to the sheriff's office, the small twin-engine Cessna 310 went down around noon on Saturday, roughly 10 miles northwest of the reservoir and about one-and-a-half miles west of the Mooncrest Ranch, at the end of Rattlesnake Creek Road. The plane had been headed from the Sheridan airport to Billings, the sheriff's office said. Shortly after a roughly 11 a.m. takeoff, the plane deviated from its scheduled flight path and circled Yellowstone National Park. After that, the pilot radioed air traffic controllers in Salt Lake City and asked for new Instrument Flight Rules to Billings. The pilot was told to climb to 14,800 feet — and they did — but shortly after that, the plane suddenly turned east toward Cody and went into a steep descent. Without another word from the plane, air traffic controllers watched it drop below the radar at 11:56 a.m. It subsequently crashed northwest of Logan Mountain. Members of the Park County Search and Rescue Unit located the plane a few hours later and spent the rest of day and Sunday processing the scene. 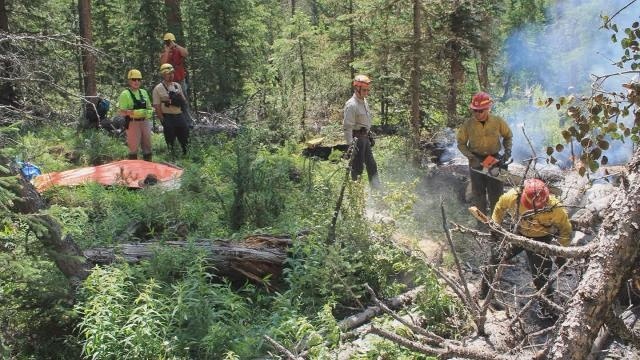 Members of the Shoshone National Forest fire team assisted them. The victims were airlifted from the site Sunday afternoon by a helicopter from Sky Aviation in Worland, the sheriff's office said. Autopsies have been scheduled for today (Monday). Representatives from the National Traffic Safety Board will ultimately be taking over the investigation. In the news release, Steward said the crash site looked as though a bomb had exploded. “The impact area is no bigger than 30 feet in diameter with debris scattered in all directions,” he said. The sheriff praised the members of the Search and Rescue unit and the Shoshone National Forest fire for the professional recovery of the victims at "what only can be described as a horrific scene." Steward also thanked the owners of Mooncrest Ranch for their help in getting rescuers to the site of the crash and thanked Sky Aviation for the helicopter.